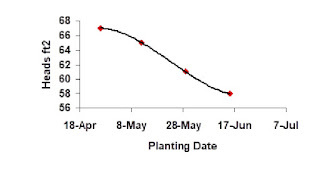 Figure 1 – The effect of planting date for on the number of heads per square feet of hard spring wheat at harvest in Langdon, ND (data and graph courtesy of Terry Gregoire, Area Agronomist, NDSU). 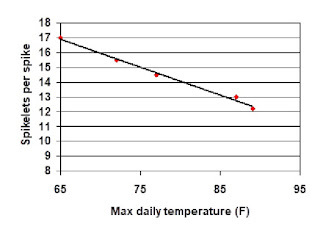 Figure 2 - The effect of maximum daily temperatures on the number of spikelets per spike that are initiated between the 4 and 5.5 leaf stage of spring wheat in Langdon, ND (data and graph courtesy of Terry Gregoire, Area Agronomist, NDSU). Because of the expectation that average temperatures will be higher as we plant later, development of the crop will speed up too. The number of heat units required for a plant to move to the next phase of development will accumulate faster. This forces development along faster and causes the plant to have less time to grow. Plants end up with fewer tillers, smaller heads, and fewer and smaller kernels per head, cutting into our yields. Table 1 - The optimum and last recommended seeding dates for small grains in Minnesota. 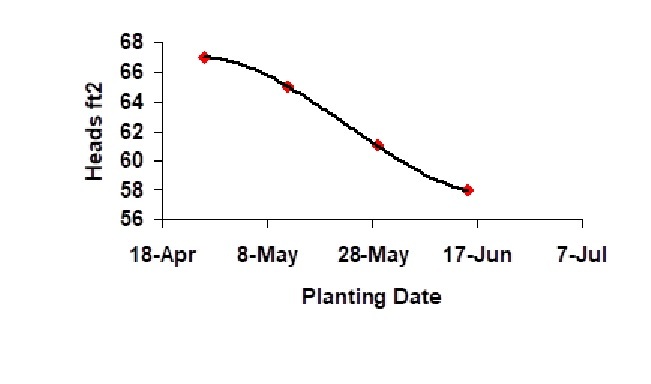 Research has shown that, on average, yields decreased 1% per day when planting is delayed past the optimum planting date. 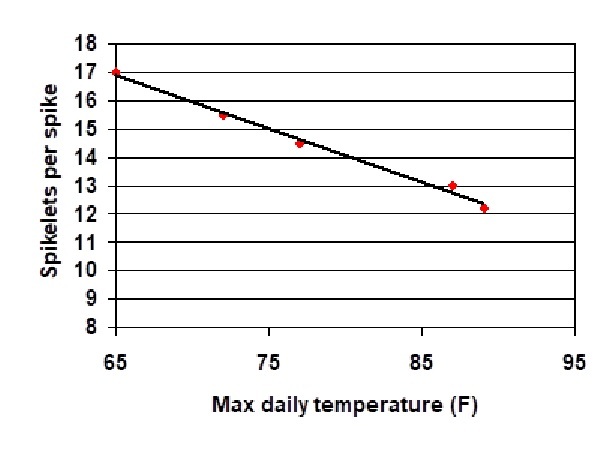 Planting after the last possible date is not recommended because of the odds that grain yield and quality (test weight) will be dramatically reduced due to heat stress. You can partially offset this yield loss by increasing the seeding rate and ensuring that you have more main stems per unit area. The recommendation is to increase the seeding rate by 1 percent for every day after the optimum planting window. The last possible date for planting is not chiseled in stone. The odds of a high(er) grain yield with excellent test weight are less in our favor with every day seeding is delayed past our optimum planting windows simply because of the expected temperatures later in the growing season.